Venice is undoubtedly one of the most unique places that you'll ever visit. A city of Art, Music, and Beauty. It attracts thousands of people each day which can make it a bit hard to get to know the city and connect to it. As we were passionate about being a part of Venice and experience different aspects of it, we decided to wake up at 5 AM and left our Hotel at 6 AM. *BEST DECISION EVER! * Waking up this early had many advantages. We had the city to ourselves, the alleys, St.Marks Square, Grand Canal, Rialto Bridge and everything. It was like the city was closed for us. We watched the beautiful sunrise over the Grand Canal as the Golden light started to hit Venice. For photo lovers, I would recommend starting this early because you will get some amazing shots of the city. We walked through the small alleys and at times we were lost . Even google map couldn't guide us where to go which was also fun because that's the part of Venice . Around 11:30 AM , we decided to catch a ferry and head to Island of Burano which was 40 min Ferry ride away and the ticket (one way) cost us €8 . Burano is a small island known for its colorful houses. The reason these houses are so colorful is because back in the days, the fishermen used to color their houses in bright colors to find their way back home. even the smallest alleyways can surprise you. We then came back to Venice and just enjoyed the city by spending some time sitting by the Grand Canal and after a while in smaller squares within the city. We walked around enjoying the sights, some music and incredible works of Art. After that, it was time for the Gondola ride. Whoever comes to Venice would most probably like to ride the Gondola. It is a fun experience but there are a few things to keep in mind. Firstly, there are many places in Venice where you can catch the Gondola, from the smallest canals to Grand canal so I recommend catch it from a main station rather than in a small alley because if you ride the Gondola from the main station, you will get to experience a major part of the city as well as the small canals. There are mainly two options with the Gondola. The 20-minute ride or the 40-minute ride. The 20-minute ride is €80 and the 40-minute ride is €120, regardless of how many people are with you, maximum 6 people can fit in a Gondola so if you are by yourself, or you are in a group of 6, you pay €80 or €120 per Gondola ride. If you are by urself or are two people, the Gondoliers will tell you,"No sharing". What they mean is that you can't wait until two or four other people show up and split the price but as long as the Gondoliers do not know that they are complete strangers who you just met 2 seconds ago, it doesn't matter so it is a good idea to keep an eye out for a smaller group of 4 people or just another couple to split the cost with if you do not wanna pay the full price by yourself. Which Gondola ride option is better? €80 or €120 is big money to spend within 20 to 40 minutes so I will suggest that take the 20-minute ride if you are just in for the experience. The 40-minute ride includes passing through a few sights like House of Casa Nova, Marco Polo etc but that you can see while walking as well. You literally just look at it for a second, you can't take a proper photo as you can't move around too much in a Gondola because of the balance. It is up to you which ride you will like to take but in my opinion, €120 isn't worth a 40-minute ride, even if it's split between 6 people. Moving on, with over 400 bridges, it is known as the city of Bridges. For me, Rialto bridge and bridge of Sighs stood out. Especially the Bridge of Sighs, as it connects the Doge's Palace and the historic prison. While walking towards the prison, the prisoners would look at their city one last time and sigh, that is how this beautiful bridge got its name, Bridge of Sighs. 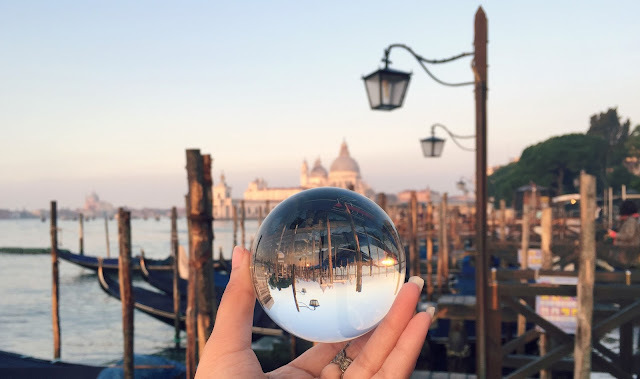 Venice has a lot to offer and at times it can be quite busy so in between the experience, don't forget to sit somewhere with a beautiful view and enjoy some Gelato or even just sit by the Grand Canal or in St.Mark's Square or even in an empty Alleyway. It is a good idea to take a break from all the walking and sightseeing and to just let the experience sink in. Don't get confused and worried that you have little time and have so much to see and just RELAX!!! Speaking of relaxing, let's talk about food. Food is everywhere in Venice. From small cafes to Gelato shops, to beautiful restaurants, Venice doesn't disappoint. And if you are looking for Halal food, there is a lot of that in Venice as well. You will most probably start by searching on Google, "Halal Food in Venice" sometimes it will work (depending on where you are staying in Venice) and sometimes it won't. Also, do call the place before you start walking towards it because when we searched online and we found this restaurant called "Orient Experience" which seemed like a good option but upon calling them, they were closed on a Monday so I don't know what their schedule is but for Lunch we came across a Pizza shop called "Crazy Pizza" and it was by accident. They didn't have a clear big sign saying "HALAL FOOD" but I guess me and pizza have a special bond so by chance I asked them if they served anything Halal and Thank God their Chicken was Halal. Always ask to see certification though. Anyway, we got two slices of Patate e Wurstel which is a Pizza flavor consisting of Chicken sausage, cheese, and FRENCH FRIES. We were so hungry that even a photo freak like me didn't care about taking a photo of it first and started it eating it anyway. As we started walking towards the Station to catch our train to Florence, we came across another Halal restaurant called Quanto Basta. This one had a full Halal menu and had a clear sign of "Halal" outside their restaurant. We grabbed some lunch and a little something for the train ride. So this was the taste of Venice from Sunrise to Sunset. It has a lot to offer with its endless beauty and uniqueness. Don't forget to watch the Venice Travel Vlog to get a better idea of all these details. See you guys next time with details about Florence. You captured Venice so beautifully! We decided to skip it the last time I was in Italy, but I can't wait to go someday! I totally agree that getting up early is always worth it, there's nothing like have a foreign city practically to yourselves. Also, French fries on pizza? Now this has me curious!